The Scottish Government (Rural and Environment Science and Analytical Services Division) Strategic Research Programme (SRP) has launched its latest spotlight document featuring examples of outcomes and impacts from the 2012-2013 annual progress report. This was presented as part of the Sustainable Intensification Workshop held at the Scottish Government Pavilion, Royal Highland Show 19th June 2014. The SRP delivers research, through trans-disciplinary collaboration, across the Main Research Providers (MRPs) (Biomathematics & Statistics Scotland, The James Hutton Institute, Moredun Research Institute, Rowett Institute of Nutrition & Health, Royal Botanic Garden Edinburgh and Scotland’s Rural College) within two broad but interlined programmes of Environmental Change (local responses to global change) and Food, Land and People (optimising the potential of Scotland's natural assets). Delivery of evidence based information on these topics is vitally important to Scotland’s future prosperity and wellbeing. The Spotlight document highlights impacts from the current strategic programme and also from research that has benefitted from the long term sustained Scottish Government funding of scientific capability within the MRPs. The Spotlight document is separated into five sections, each a strategic priority for the research: supporting policy and practice, supporting economy and innovation, developing collaborative and multidisciplinary working, scientific resilience and all as underpinned by scientific excellence. 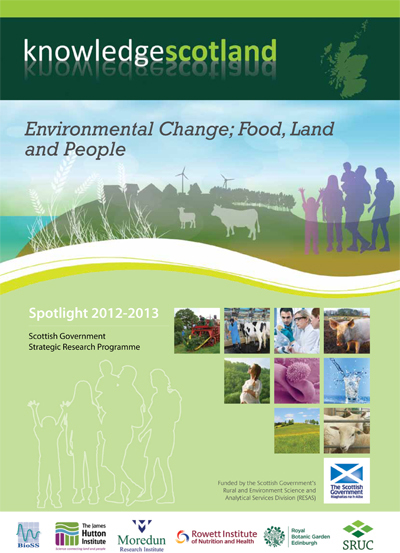 Highlights on policy and practice include providing analysis for the Water Resources (Scotland) Act 2013, the sustained and ongoing provision of socio-economic and scientific evidence in support of Bovine viral diarrhoea (BVD) eradication, analysis to assist policy makers engaged in reform of the Common Agricultural Policy. Examples of providing innovation include the development of vaccines targeting bacterial diseases of livestock, therapeutics for treatment of human inflammatory bowel disease and a significant breakthrough in cereal genomics marked by the publication of the high resolution draft for the barley genome. New collaborations highlighted include aims to further improve understanding of food choices made by vulnerable young people, to further advance sheep welfare and an MRP initiative to address food, water and energy security in collaboration with the Chinese Academy of Sciences and China Agricultural University.